I spotted this converted Sorte Jernhest cargo bike at a harbour festival. It was equipped to sell food of some sort. 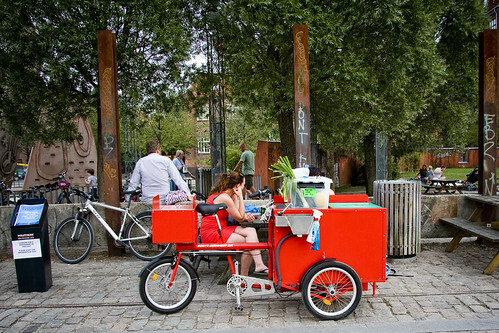 I've blogged quite often about Copenhagen's cargo bike culture and the wide variety of cargo bike brands in the city. There seem to be some patterns. 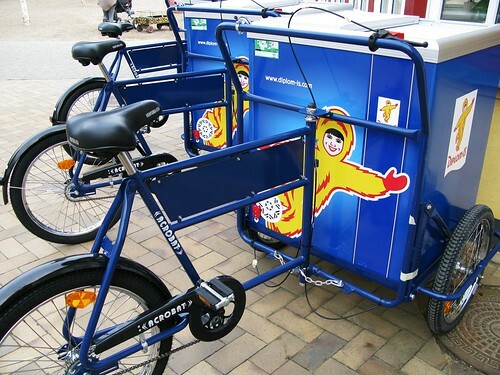 The Sorte Jernhest, with it's rear-wheel steering capabilities, is a popular cargo bike for converting into other incarnations. 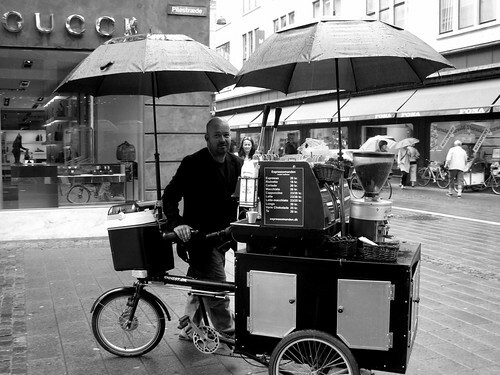 Ole [above] converted one himself into his famous Coffee Bike, Fully functional and rideable and great coffee, too. 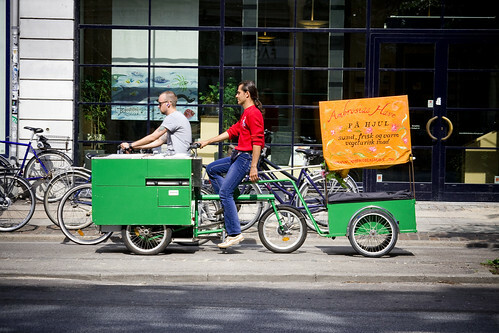 This Sorte Jernhest [it means 'black iron horse', in Danish, with 'iron horse' being one of the many nicknames for the bicycle in Denmark] serves hot vegetarian food and even has a trailer attached. Another company, lesser known, makes vending bikes as well. Esimex converts their Acrobat short john bikes into a variety of models. Here, the Copenhagen Zoo sells ice cream around the gardens. 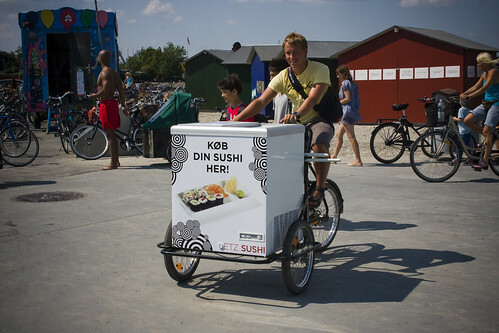 And here's a sushi bike at one of our beaches. By all accounts, the Sorte Jernhest is the best cargo on the Danish market for heavy-duty vendor usage. The Esimex is cumbersome and the centre of gravity is all wrong. I tried one at the zoo and it was frightfully unstable. While you could ride for miles [slowly] on the Sorte Jernhest, the Esimex isn't very inviting when you have to ride a distance out to the beach or even around town. I've never seen any ice cream seller riding in the Zoo, only pushing them about. For two wheeled entrepeneurship, there's always the Bullitt.